Why Watch it Today? : Director Martin Scorcese was born today in 1942. Scorcese is responsible for many dark films, including previous Movies of the Day Raging Bull, Casino, and The King of Comedy, but my personal favorite remains this bleak character study. Taxi Driver is a modern take on John Ford’s The Searchers, set in a decaying New York City rather than the Western wilderness, only this time Ethan is desperately searching for someone to save instead of on a quest to save his niece. 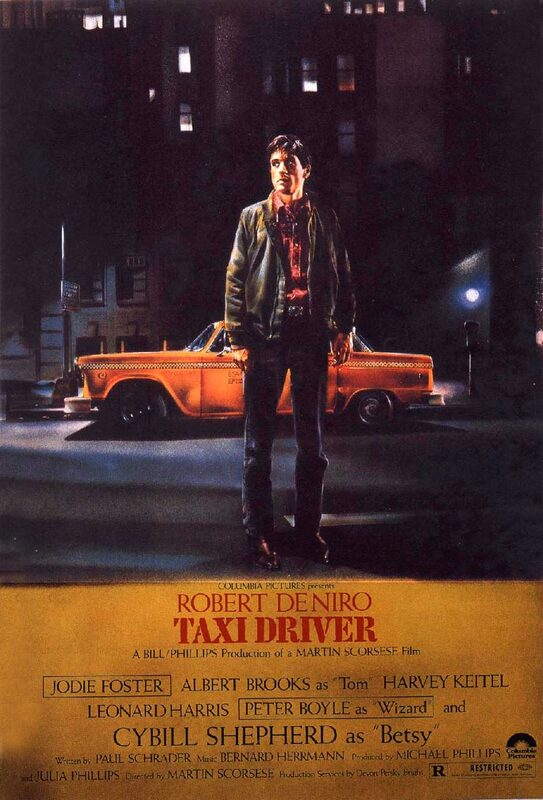 Robert De Niro was nominated for his tour-de-force performance; Jodi Foster for her amazing supporting work; composer Bernard Hermann for his classic score, one of his last before his death; and the film was nominated for Best Picture, but Taxi Driver lost every time despite being one of the greatest films of the 1970s. Other Choices: We’ve featured many Scorcese movies, including After Hours, Hugo, and The Last Temptation of Christ. This entry was posted in Movie of the Day, Neo-Noir, Thriller and tagged Albert Brooks, Best Actor Nominee, Best Music Nominee, Best Picture Nominee, Best Supporting Actress Nominee, cab driver, character study, Columbia Pictures, Cybill Shepard, grindhouse, Harry Northup, Harvey Keitel, insanity, it's not over, Jodie Foster, Joe Spinell, low-budget, Martin Scorcese, New York City, Paul Schrader, Peter Boyle, pimp, prostitutes, racism, racists, Robert De Niro, teens, vigilantes.